TEAS stands for "Tanabe Electric Active Suspension" and is the counterpart of the Sustec Pro FIVE suspension. This compact unit is the 'brain' behind the highly sophisticated new Tanabe suspensions. TEAS is a fully programmable dampener controller that allows for dampening force to be automatically adjusted while driving. 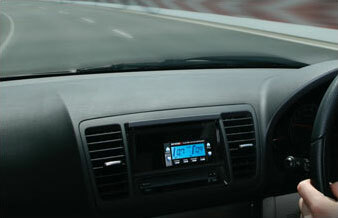 TEAS accomplishes this by connecting and using the signal from the vehicle's Speed Sensor. TEAS active dampening control is uniquely possible due to the use of the specialized valving of the FIVE, in conjunction with TEAS' slim, high speed actuators. These actuators change dampener settings in 1/100ths of a second, which is necessary as TEAS can continuously change settings at different speeds. Some new luxury vehicles have actuators on their suspensions to switch from Normal to Sport suspension, TEAS' actuators exceed these automakers in quality and reliability. The ultra slim profile actuators have a protective boot, and the actuators are made of metal instead of the bulky inexpensive plastic used by some competitor brands. Other manufacturers have extremely noisy actuators since their units are not active, and must be manually adjusted. TEAS has settings to have an audible beep for dampener changes, with volume settings, and logically, an OFF option for quiet operation. TEAS uses onboard flash memory to store settings. This onboard memory means that memory settings can be saved and recalled, even when the battery is disconnected. TEAS can store four manual mode presets which also work as Active Mode "base maps." One Active mode program may be saved for a total of Eight settings. TEAS also has backup memory onboard, should you wish to restore default settings. TEAS uses a high contrast LCD display for easy reading. Blue LED backlights can brighten and dim for simply. trouble free night and day usage. TEAS is a passive system that connects to and reads many different speed signals, and has calibration options to adapt to the speed signal of any vehicle. Since many cars are equipped with aftermarket stereos, amplifiers, and other hi-interference devices, TEAS has the option of adjusting sensitivity, to prevent getting false electronic signals and interference from these types of devices. TEAS is made for use with the Sustec Pro SEVEN and FIVE coilover systems.